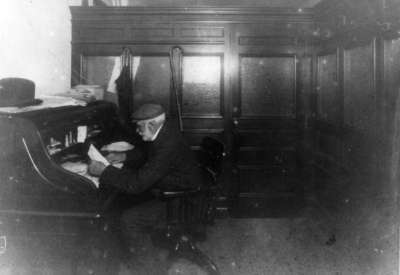 A black and white photograph of John Dundas Howden at his desk in the post office. John Dundas Howden was Whitby's postmaster from 1885 to 1924. This picture shows him at work at his desk in the post office that was opened at the Four Corners in September 1910. The stone post office was built at the south west corner of Brock Street and Dundas Street between 1908 and 1910. It opened in 1910. The clock was installed in 1911 after being shipped from England. It was closed in 1956 and demolished in 1959.